In Part 13 of this LFCS (Linux Foundation Certified Sysadmin) series we explained how to use GRUB to modify the behavior of the system by passing options to the kernel for the ongoing boot process. Similarly, you can use the command line in a running Linux system to alter certain runtime kernel parameters as a one-time modification, or permanently by editing a configuration file. Thus, you are allowed to enable or disable kernel parameters on-the-fly without much difficulty when it is needed due to a required change in the way the system is expected to operate. The latest specification of the Filesystem Hierarchy Standard indicates that /proc represents the default method for handling process and system information as well as other kernel and memory information. Particularly, /proc/sys is where you can find all the information about devices, drivers, and some kernel features. dev: parameters for specific devices connected to the machine. fs: filesystem configuration (quotas and inodes, for example). vm: use of the kernel’s virtual memory. indicates that sr0 is an alias for the optical drive. In other words, that is how the kernel “sees” that drive and uses that name to refer to it. In the following section we will explain how to change other “more important” kernel runtime parameters in Linux. Based on what we have explained so far, it is easy to see that the name of a parameter matches the directory structure inside /proc/sys where it can be found. To set the value for a kernel parameter we can also use sysctl, but using the -w option and followed by the parameter’s name, the equal sign, and the desired value. It is important to note that kernel parameters that are set using sysctl will only be enforced during the current session and will disappear when the system is rebooted. Then run following command to apply the changes to the running configuration. fs.file-max specifies the maximum number of file handles the kernel can allocate for the system. Depending on the intended use of your system (web / database / file server, to name a few examples), you may want to change this value to meet the system’s needs. Otherwise, you will receive a “Too many open files” error message at best, and may prevent the operating system to boot at the worst. If due to an innocent mistake you find yourself in this last situation, boot in single user mode (as explained in Part 13 – Configure and Troubleshoot Linux Grub Boot Loader) and edit /etc/sysctl.conf as instructed earlier. To set the same restriction on a per-user basis, refer to Part 14 – Monitor and Set Linux Process Limit Usage of this series. kernel.sysrq is used to enable the SysRq key in your keyboard (also known as the print screen key) so as to allow certain key combinations to invoke emergency actions when the system has become unresponsive. The default value (16) indicates that the system will honor the Alt+SysRq+key combination and perform the actions listed in the sysrq.c documentation found in kernel.org (where key is one letter in the b-z range). For example, Alt+SysRq+b will reboot the system forcefully (use this as a last resort if your server is unresponsive). Warning! Do not attempt to press this key combination on a virtual machine because it may force your host system to reboot! A better and easier way to set individual runtime parameters is using .conf files inside /etc/sysctl.d, grouping them by categories. If you choose to use this approach, do not forget to remove those same lines from /etc/sysctl.conf. In this article we have explained how to modify kernel runtime parameters, both persistent and non persistently, using sysctl, /etc/sysctl.conf, and files inside /etc/sysctl.d. In the sysctl docs you can find more information on the meaning of more variables. Those files represent the most complete source of documentation about the parameters that can be set via sysctl. Did you find this article useful? We surely hope you did. Don’t hesitate to let us know if you have any questions or suggestions to improve. Thanks Gabriel. Very helpful article and I appreciate the time you spent writing this. Will definitely be useful for the LFCS exam. Also, have not seen it mentioned yet that the man page for proc, under the /proc/sys section, says that the sysctl system call has been deprecated. Thank you for pointing that out! Yes, those are indeed typos. @Ravi, still see the second one. I corrected and its showing at my end, could you clear your browser cache and check? Already tried different browser and access via mobile, same thing.. I think I am confuse, could you send me exactly what needs to be changed…. Thanks again, yes now I got it, corrected as per your suggestion. 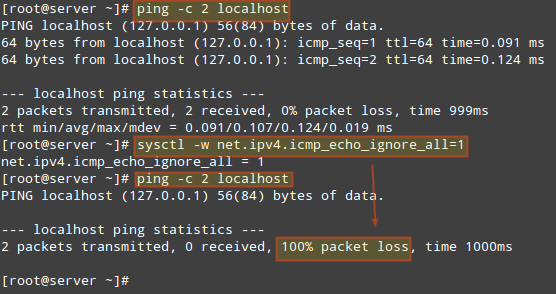 I think that with this “# echo “net.ipv4.icmp_echo_ignore_all=1″ >l;>l; /etc/sysctl.d/net.conf” ou mean this “# echo “net.ipv4.icmp_echo_ignore_all=1″ >> /etc/sysctl.d/net.conf” to append this line to the net.conf file. Thanks for pointing out that error, corrected in the article.